This is the third leather good that I’ve gotten from Secret Felicity and each product has been absolutely outstanding in quality. This beautiful wallet comes with a dust bag so that it stays beautiful when not is use. 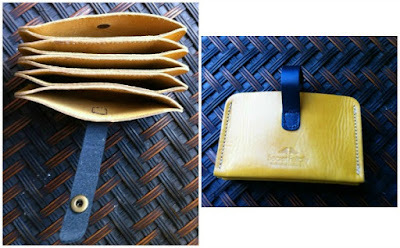 As for the wallet itself, the leather is of superior quality, it offers an on-trend yet timeless color combination of mustard yellow with a black accent. This is a handmade item so all are basically one of a kind and the crafting is superior with consistent stitching throughout. It has a button closure and five card slots, which is all you’ll need! I’ve already received so many compliments about this wallet and everyone wants to know where I got it. I love to see their faces when I tell them the price point! You simply can’t get this quality at this price! The Secret Felicity Women's Compact Handmade Leather Wallet sells for $39.95 on Amazon and is the perfect gift for her for any occasion!